Young Poets Network is delighted to be collaborating with The Royal Society for the Protection of Birds, to get you writing about the astonishing avian world. Wing your poems our way and winners will be published online and sent prizes. The RSPB is the country’s largest conservation charity, protecting birds, other wildlife, and the special places in which they live. We love nature and we’re passionate about wildlife and wild places. Our natural systems provide us with services we often take for granted – such as fresh water and food. The value of these to every one of us is enormous. However, habitats and species are much more than mere resources; studies are proving what we’ve always somehow understood – that the natural world is good for us, for our physical and mental well-being, and for our happiness. We save birds and other wildlife – preventing them from becoming extinct. We talk about this in terms of “giving nature a home”; it’s a strong, memorable metaphor for conservation. It also encompasses everything we want our members and supporters to do so that birds and other wildlife can thrive again. We save the environment – we can’t stop climate change on our own, but we can do everything within our power to lessen its effects and to help wildlife adapt. Our conservation work helps, and we’re also campaigning to influence policies on energy, agriculture, transport, planning, fisheries, climate and water use, which all affect the environment. 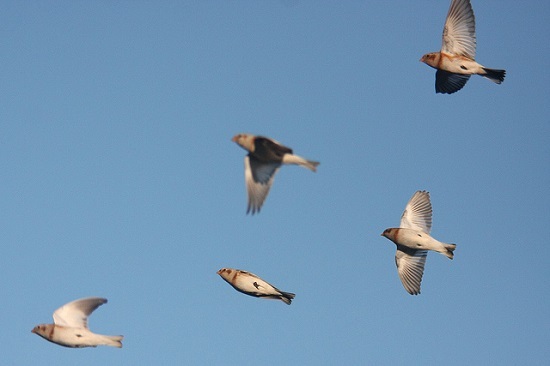 UK birds – the UK is a great place for a wide variety of birdlife. It contains important breeding and wintering sites for many species. We are also visited by many rare visitors, which have arrived in the UK by mistake after being blown off course, often from North America. Birds that have been recorded in a wild state in Britain are included on the British list. Some breed here in the millions, such as wrens, whereas others may have only been seen here once, such as the least tern. The British list currently stands at 596 species. Watching wildlife in winter can be magical, particularly if we have snow! It can also be a good time to look for tracks and signs left by other animals and winter is one of the easiest times to observe birds clearly. Trees have lost their leaves, light is limited, and wild food is scarce. Winter can be tough for wildlife – food is often in short supply and the days are short, meaning animals have less time to find what they need to survive. This means that birds are particularly visible and active as they work to keep themselves alive in such harsh conditions – this is the time of year in which Tennyson’s phrase “Nature, red in tooth and claw” seems more than usually apt. Birds and your imagination – Wildlife has always enjoyed a reciprocal relationship with the arts. The natural world inspires music, painting and literature, and these can provide vicarious, emotive experiences for those who interact with them – think of William Wordsworth’s ‘I Wandered Lonely as a Cloud’, Jack London’s White Fang, Ted Hughes’ ‘Hawk Roosting’, or J.A. Baker’s The Peregrine. These works are deeply rooted in an understanding, appreciation and quite probably a love of wild spaces and the creatures that inhabit them. One way to help you observe your local birds, and help them out, is by providing food for them. You can make their lives that little bit easier, gain an insight into their behaviour, and enjoy the spectrum of colour, shape and pattern that makes up our common garden birds. More information can be found at our website: rspb.org.uk. The challenge is to write a poem about birds – anything to do with them. You might like to write about the behaviour of a particular species; the effect of winter on birds; the importance of conservation; how birds influence our feelings and imagination. Check out the works mentioned above, and have a read of this article by Adam O’Riordan, about the enduring importance of birds to poets. For practical inspiration for your poems, why not take part in The RSPB’s Big Garden Birdwatch? You can take part on your own or as a group or family, and you can even take part in your local park if you don’t have a garden. To get involved, just pick an hour over the weekend of 24-25 January 2015 and tell us what you see. It couldn’t be easier! Take a closer look at the wildlife on your doorstep and use what you see to inspire your work. Winners will receive a prize from the RSPB and an exclusive Young Poets Network notebook. This challenge is for poets aged 25 and under, from all over the world. The deadline is Sunday 1 February 2015. You can send a page poem written down, or a performance poem as a video or as an audio file. Send your poems to educationadmin@poetrysociety.org.uk with your name, age and address. By entering, you give permission for Young Poets Network and The RSPB to reproduce your poem in print and online, though copyright remains with you. Hi Chloe, submitting more than one poem in the same email is absolutely fine! Hi, how many poems are you allowed to submit to the RSPB Challenge? Is it a maximum of two? Hi Neha. You can send as many poems as you like for this challenge! Hi Samuel, you can submit as many poems as you like to this challenge. Will entrants receive an acknowledgement that their emailed entry has been received? Thanks! Hi Laura, If entrants ask for email confirmation they will receive it, otherwise not. is this an international competition??? Hi there, unless clearly stated, all our writing challenges are open to poets from all over the world – good luck! How can i enter this competion about birds ? Hi Mariam, I’m afraid this competition has closed – but our Gothic challenge and Ofi Press challenge are still open! have the results for the competition on birds been declared? Hi Ilika, the judges at the RSPB are still deciding on the winning poems – hopefully they should be announced in the next week or so!